Presented as part of the Melbourne Festival and now in its third year, Dance Territories aims to emphasise the existence of an international contemporary dance neighbourhood. Curated by Dancehouse Artistic Director Angela Conquet, the double bill pairs an Australian artist with an international artist, and invites audiences to explore the possible correspondences and connections between them—whether aesthetic, ethical, philosophical or political. 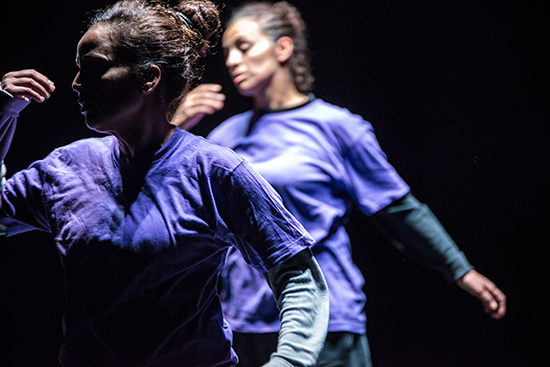 This year the two artists are French-Algerian choreographer Nacera Belaza, currently based in Paris, and Berlin-based Indigenous Australian and British cross-disciplinary artist Sarah-Jane Norman. And the connection between them is a political one. On the one hand we have Belaza’s The Shout (Le Cri), an enchanting piece of abstract minimalism that binds the audience in a series of gestural incantations. This is in many ways comparable to the work of other Francophone guests at Dancehouse in recent years: Eleonore Didier, Cindy Van Acker, Myriam Gourfink and Perrine Valli. All share a similar commitment to ritualistic repetition and the slow, often imperceptible development of a movement theme. On the other hand, the work of Norman is slightly unusual programming for Dancehouse. Here we have three durational performance and installation pieces excerpted from a larger work, Unsettling Suite (2013), originally commissioned by Performance Space. 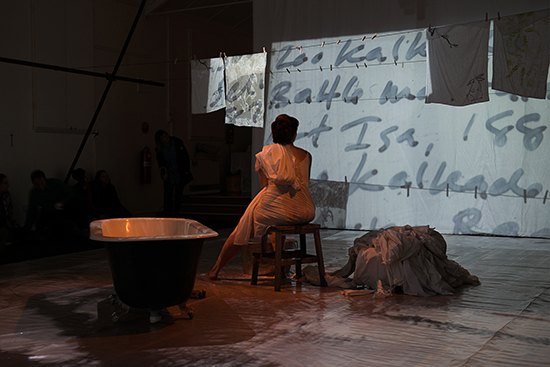 In The River’s Children (2013), Norman hand washes white items of clothing contributed by audience members in water sourced from the Murray River while a projector flashes fragmentary details of various documented massacres of Aboriginal people. 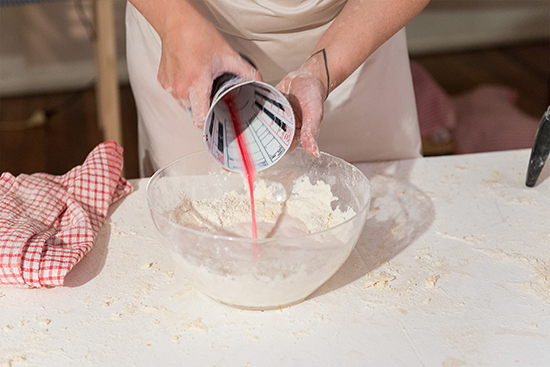 In Take This, For It Is My Body (2010), audience members are offered a batch of scones containing a small amount of Norman’s blood. And in Heirloom (2013) a number of oriental Wedgwood Willow Pattern plates are appropriated for a new porcelain collection, again using Norman’s blood as a medium. The blood scones are particularly effective. I came to the event thinking that the work might be over-determined. Isn’t this, I asked myself, one of those conceptual live art pieces where the actual performance is redundant? Won’t everyone’s response be more or less the same? I was therefore surprised to discover, sitting at a table with a small group of other participants, how open the work is to multiple interpretations. A scenario, which had at first seemed like blunt symbolism, proved, in the presence of the scones, to be a radically ambivalent invitation. Two audience members straightaway jumped on the scones, liberally applying jam and cream and eating with enthusiasm. Another explained that she thought the ensanguined bread was like a kind of Uluru: something to be respectfully observed from a distance. A fourth pleaded vegetarianism, and a fifth, perhaps taking the work’s messianic title literally, treated the proffered scone as if it were a communal wafer, placing only a small fragment on his tongue and declining the condiments. It was fascinating theatre. Both artists offer strategies by which a history of resistance to colonialism can be evoked and extended through the body. Belaza says in her program notes that the shout represents the moment when the anchor does not let go. Her work is grounded in the rhythms of Gnawa, a kind of ancient African spiritual music based on the chant-like repetition of refrains and phrases. This is the tradition which disciplines—or anchors—her experience of an increasingly fragmented postmodern world. In this sense, Norman’s work, too, is a kind of shout or scream: an attachment to specific places and specific rituals, and the ambiguous cry of the blood. See the realtime tv video interview in which Sarah-Jane Norman guides Gail Priest through the Unsettling Suite installations and read Norman’s essay “Blood is such clever stuff,” in RealTime 111, the RealBlak edition.